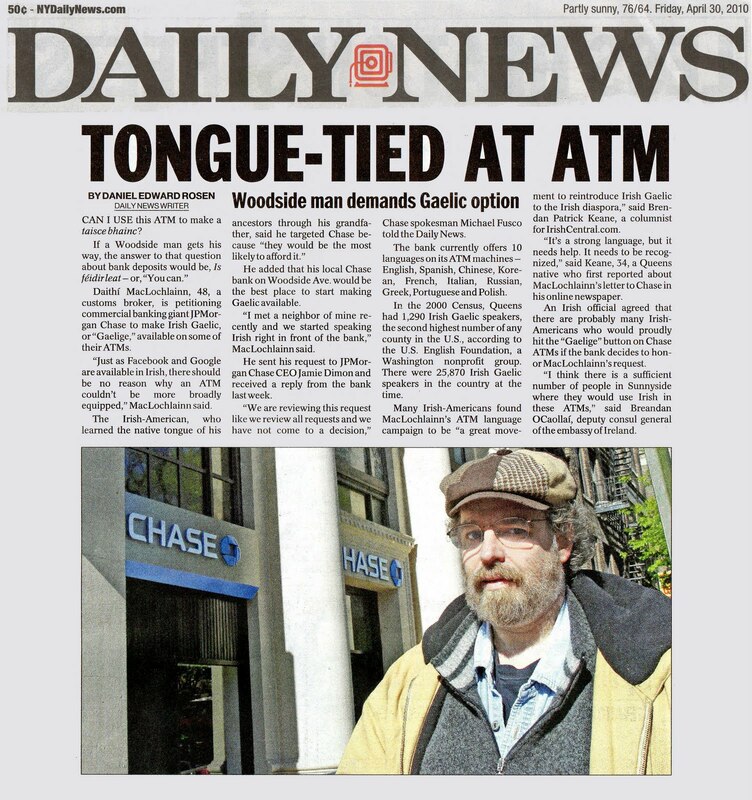 The New York Daily News has picked up on the campaign to get Chase Bank's ATM machines to offer an Irish language option in heavily Irish neighborhoods. I reported on this story when Chase Bank first answered Daithí MacLochlainn's petition by promising to consider the request, you can read that story here, or in the Sunnyside Times, here. Since then, there has been growing support from Ireland and the New York Irish community to make this happen. Seán Ó hAdhmaill, who is one of the language movement's brightest young leaders, has joined with us to form a working group (meitheal) to see this issue through to implementation--you can help by joining up on Facebook here. Doiminic Ó Brolcháin has also joined the New York group from his home in Newry where he works on behalf of the needlessly delayed Language Act for Civil Rights in the north. Bank of Ireland, for example, offers ATM service in Irish in the Republic, but not to residents of the north, violating the spirit of the peace process. The clipping from the Daily News newspaper with color photo is below, and the link to the article can be seen here.